ST. GEORGE – A St. George neighborhood was on high-alert Saturday evening as police searched for a man with a handgun who had allegedly fired the gun at least twice in and near a home before fleeing the scene. The man was located Sunday morning and arrested on a variety of criminal charges. Around 6:30 p.m., officers responded to a psychiatric call at a St. George residence where a “distraught” man, later identified as Ronald Bodi McEwen, interfered with a phone call a woman was trying to make to authorities for help, St. George Police Sgt. Spencer Holmes said. During the alleged argument with the woman, McEwen discharged a handgun inside the residence and then again at a nearby street sign. 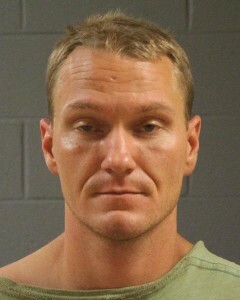 McEwen then fled the home, putting the Little Valley neighborhood of St. George and surrounding area on high-alert as word quickly spread that residents should stay inside their homes and lock their doors while police searched the area for a man with a gun. While the handgun was recovered at the scene Saturday night, McEwen wasn’t located until Sunday morning, walking in the area of 400 W. St. George Blvd. where he was apprehended by police. The stolen firearm was an active case in St. George, Holmes said, unrelated to the incidents that unfolded Saturday night. In addition to the stolen gun, McEwen was found to be in possession of other stolen items including ammunition, drugs and drug paraphernalia. McEwen was arrested and booked into the Washington County Purgatory Correctional Facility. According to booking information, McEwen was charged with a second-degree felony for theft of a firearm; two class A misdemeanors for theft between $500-$1,500; and six class B misdemeanors for discharging a firearm in the city, interfering with an emergency call, criminal mischief and possession of drugs and drug paraphernalia. During a March investigation, officers discovered an in-cab camera in a Toyota McEwen had been driving, police said. Footage from the camera allegedly showed McEwen crashing into a block wall twice and committing other offenses before throwing a jug of chemicals out the Toyota’s window. The video then showed McEwen swerving on the roadway and apparently choosing not to stop for police as he looked into his rear-view and side mirrors while police pursued him with emergency lights flashing. McEwen then crashed his Toyota into the back of another truck that was stopped at a red light. After receiving medical clearance, McEwen was taken into police custody. I love how some people think all drugs should be legalized because they’re harmless and a “right”, yet it seems every time you read a story like this drugs are involved. Surprise! I have never heard drugs being called ‘harmless’ or ‘right’ in that argument. The argument is that the everyday person isn’t going to start doing drugs just because they are there. I sure as hell won’t be buying heroin just because I can. But as long as it is illegal, people will still get it. Same argument goes for guns. You can make them illegal but the people who want them will still get them. some people think drugs are a “right”. They are most certainly not. I think drugs should be legalized but not for that reason. I have two main reasons for legalizing drugs. I will outline them below. 1.)Taxes. If we follow the example of states like Colorado then we could legalize drugs, sell them from certified and licensed dispensaries and collect most of the money that is now going to the cartels in South America and Mexico. This money could be used for everything from education to infrastructure. 2.) The simple fact of the matter is that people who want to do drugs, will do them whether or not they are legal and will, obviously, get them from any source they can, however they can. Similar to how people got alcohol during prohibition. You could make the argument that drug dealers will still be out there doing there thing but think about this, How many people do you see BUYING alcohol from some random dude on the street? Am I saying that it doesn’t happen? Of course not but it’s not even close to the majority. Most drugs that I am aware of were originally designed for medicinal use such as pain control. The problem was that people became hooked and started overdosing so they made them illegal because people were dying. Unfortunately most of those people who were hooked didn’t stop using the drugs because they had ben made illegal, they just found another way to get them. Similar, as I said, to what they did during prohibition. Other more greedy people saw an opportunity to make money off of these people and sold the drugs from their homes. When the dealers ran out, they started making their own concoctions in their homes using what they had on hand and selling that. I believe that if we legalized drugs like Marijuana and sold them in their pure form people who use those drugs would (mostly) buy from the legal dispensaries drastically reducing or even eliminating the number of drug dealers and their “labs”. Legalizing drugs would also cut the prison population a significant amount saving us literally millions if not BILLIONS of dollars every year because we would not be putting people in prison for lengthy periods of time because they got caught smoking a joint. In addition doing so would eliminate the chance that a violent offender gets a lesser sentence or released early because of overpopulation caused by the mandatory sentencing most states have for non-violent drug offenses today. 1) Colorado is finding that the money they’re raising through tax revenue just ends up getting spent on increased costs in the police and judicial system. Also, are you proposing we legalize prostitution as well? The same argument applies, it’s a great source of revenue, right? I think the decision should be made on what is right, not what is most profitable. 2) Why not just legalize everything then, at any age? The fact is that when you legalize something you legitimize it, particularly in the eyes of the youth. I have witnessed many youth that I know personally who have rationalized their way to pot use, and frankly, none of them have amounted to a hill of beans and are living at home rotting away. That is in stark contrast to those who have chosen to stay away from drugs and are educated, employed, successful, etc. I can’t think of a single one that has chosen the pot-road and gone on to success without first going through hell to abandon it entirely. To me legalizing it because “they’re going to do it anyway” is a stupid argument founded on nothing. I’m not looking at what is profitable or right. I’m looking at what is the greater good. ” It costs the State an average of $27,117 to house one inmate for one year. This includes meals, legal fees, maintenance, medical treatment, transportation, personnel, security equipment, programming and rehabilitation, as well as various other cost associated with incarceration”. When I consider questions like “why should we legalize drugs, I do research and when it comes to questions like this I ask myself why are we spending approximately $27,000 PER YEAR to put some guy whose only crime was that he or she got caught smokin’ a blunt in a back alley in Salt Lake in PRISON FOR YEARS when that money could be spent on things like educating our children? I ask you Brian, which would you rather do? Send a person whose only crime was smoking a blunt to prison or educate a child?